Do we know if Uk is getting FF XII Limited Edition? 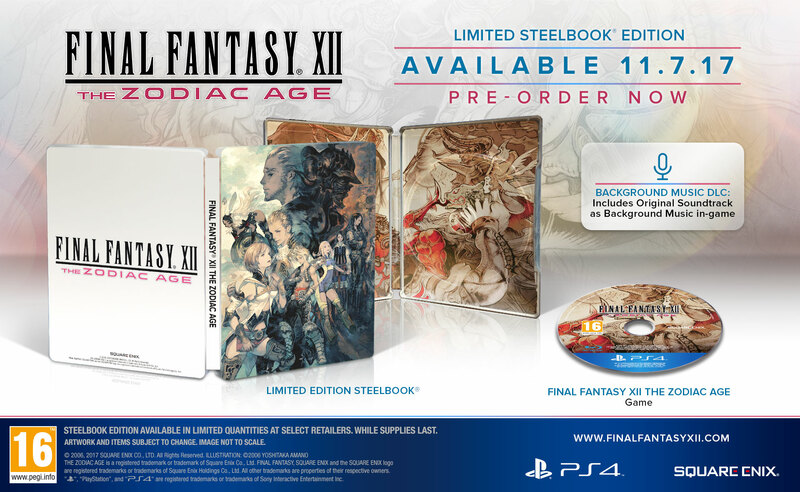 I am bumed to find out that Uk nor Eu SE store has the limited edition for FF XII. Does anyone know if we would be getting one here in the UK. No I mean just the steelbook limited edition. Is there anyone here on the forum who can check and confirm. It would be much appreciated. Is that not what this is? It might be worth waiting a few weeks to see if it'll become listed on their store. @MSBi Playstation has a policy of leaving region-locking to the discretion of the publisher. I don't know if Square has locked FFXII. If they haven't, you should be able to simply purchase one through an international distributor. That is if you don't mind paying a little extra for shipping. Asking for £25 extra for tax and shipping so thats £65 altogether. I don't know if its worth that price hehe. Got a reply from Square telling me they don't know if UK will be receiving limited edition. So i'm guessing probably not. I I pay for shipping and tax to get the US version then I am looking at paying £53 estimate. This is £8 more than the actual cost of the game if it released in uk. "A Limited Edition will be available to pre-order, including the game, an exclusive steelbook featuring artwork by renowned illustrator Akihiko Yoshida (FINAL FANTASY TACTICS, FINAL FANTASY XIV, NieR: Automata™), as well as Background Music DLC." I don't see that anywhere on EU Square Enix store. They only have standard edition. @MSBi I'd imagine it'll be listed at a later date. I guess if you wanna secure early pay the extra for the NA one.